Windows Admin Notebook: I've lost Internet Explorer Maintenance add-in in from Group Policy Management Console! 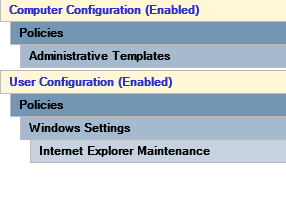 I've lost Internet Explorer Maintenance add-in in from Group Policy Management Console! 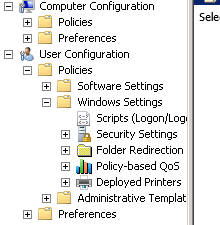 Guys, I can't see Internet Explorer Maintenance add-in in Group Policy Management Console! It was there and now it's gone. See, I have this policy configured and it works. So, what happened? I am omitting here the necessity to import Internet Explorer .adm file to be able to manage it because it's another topic to describe. Well, it's something that you probably didn't expected to be connected with - Internet Explorer version. You've probably have had configured automatic updates on your server, haven't you? Well, if your server have had installed Internet Explorer 10 or 11, then you've lost possibility to configure Internet Explorer earlier versions (till 9) from GPO mmc. 2.If you can't uninstall newer versions of IE by any reason, you could use other server where you can see Internet Explorer Maintenance add-in, even if it's in different domain.